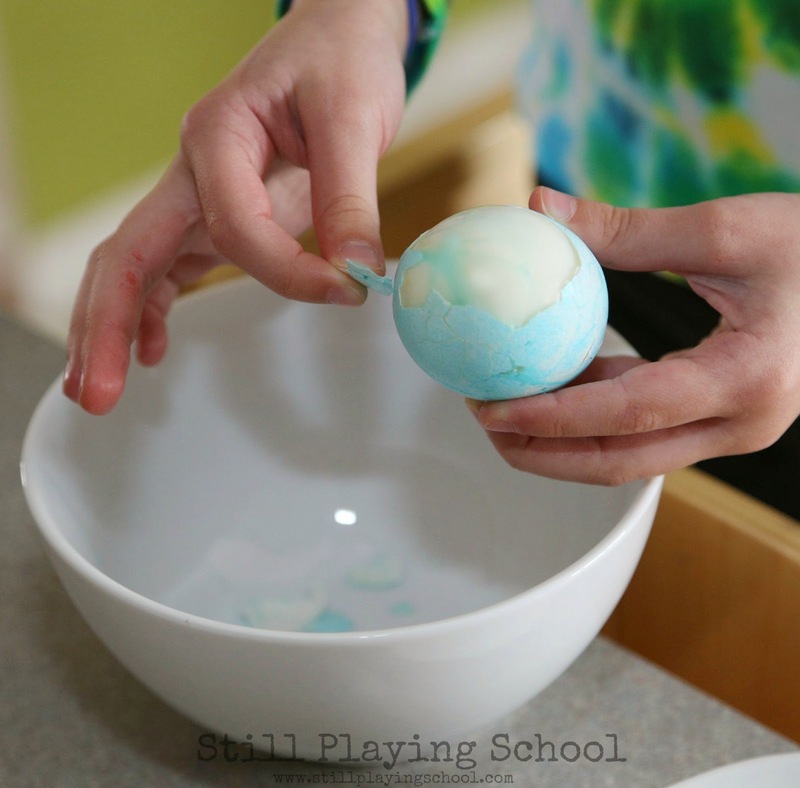 After celebrating Easter you might have a lot of hard boiled eggs to use up! Our preschooler is back in the kitchen with me for our Cooking with Kids series again to help me make an easy egg salad recipe. 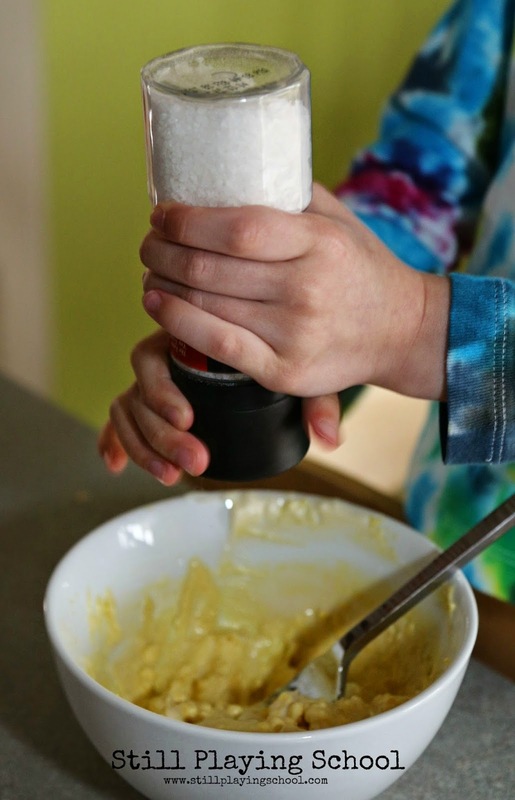 We've absolutely loved this Cooking with Kids A to Z series from Rainy Day Mum so far! It reminds me to regularly invite out preschooler to help in the kitchen. Her competence and confidence have grown so much already! She frequently asks to help me even when I'm not working on a Cooking with Kids recipe. 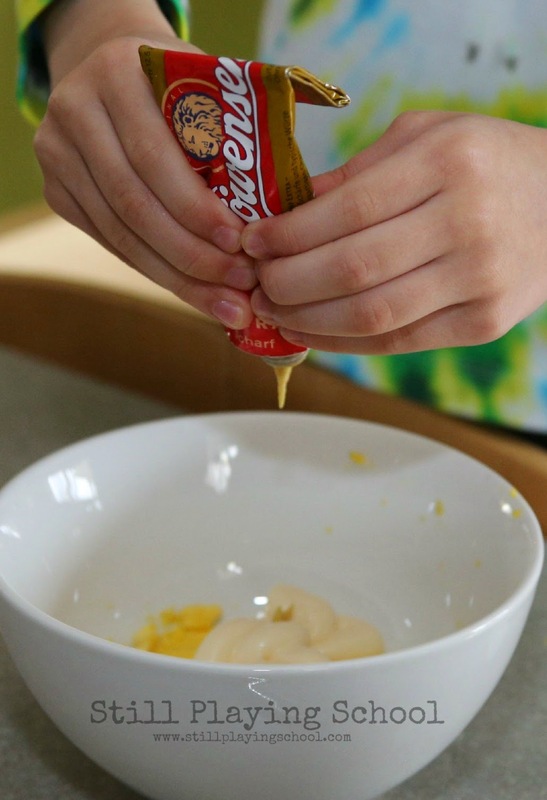 One of the benefits of cooking with kids is the many ways fine motor work is strengthened in the kitchen! Those same little muscles that are motivated to work at cracking and peeling eggs are going to be used to hold pencils and scissors for academic work, too. 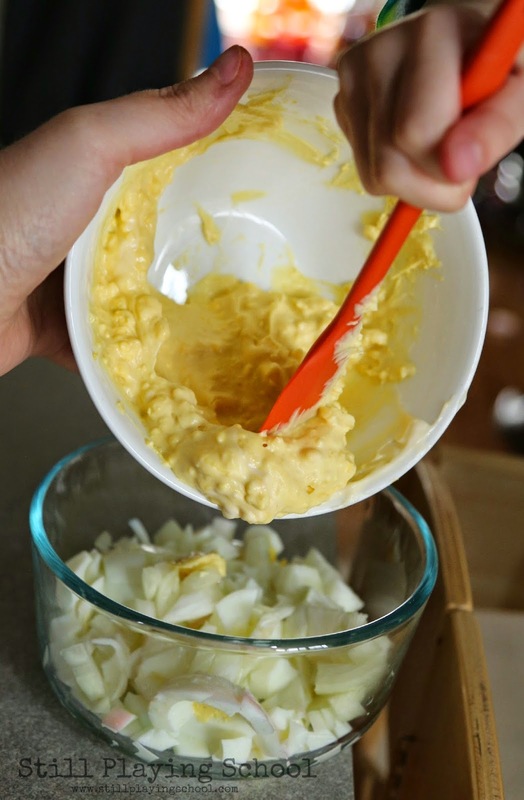 This egg salad recipe is super simple and kid friendly! We used four hard boiled eggs (dyed for Easter). We cook them in our egg cooker because it makes them super simple to peel by creating a little air bubble at the top inside the shell as they cook upright! 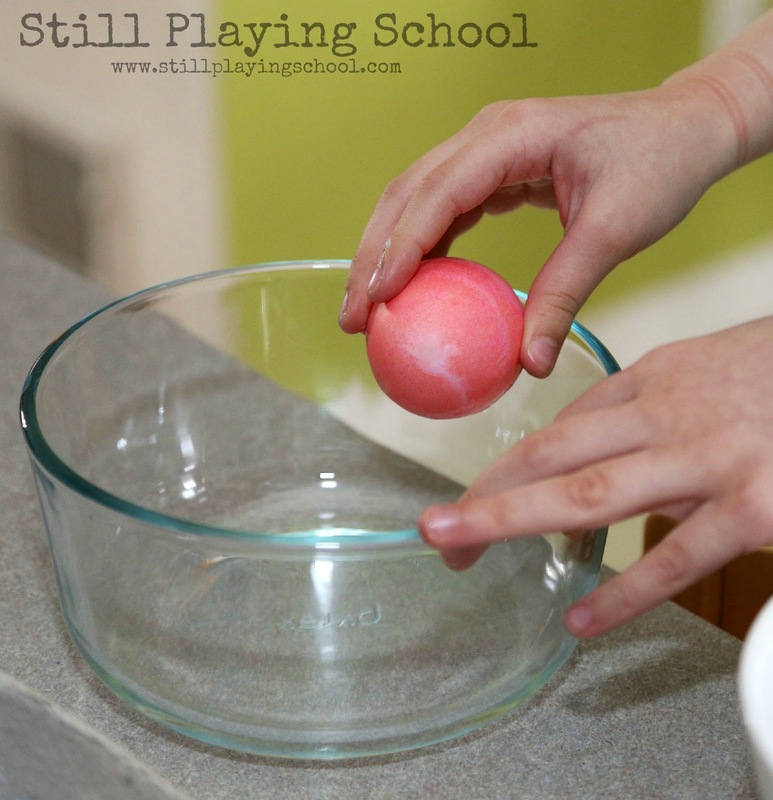 If you struggle with peeling hard boiled eggs I promise you this is the solution! 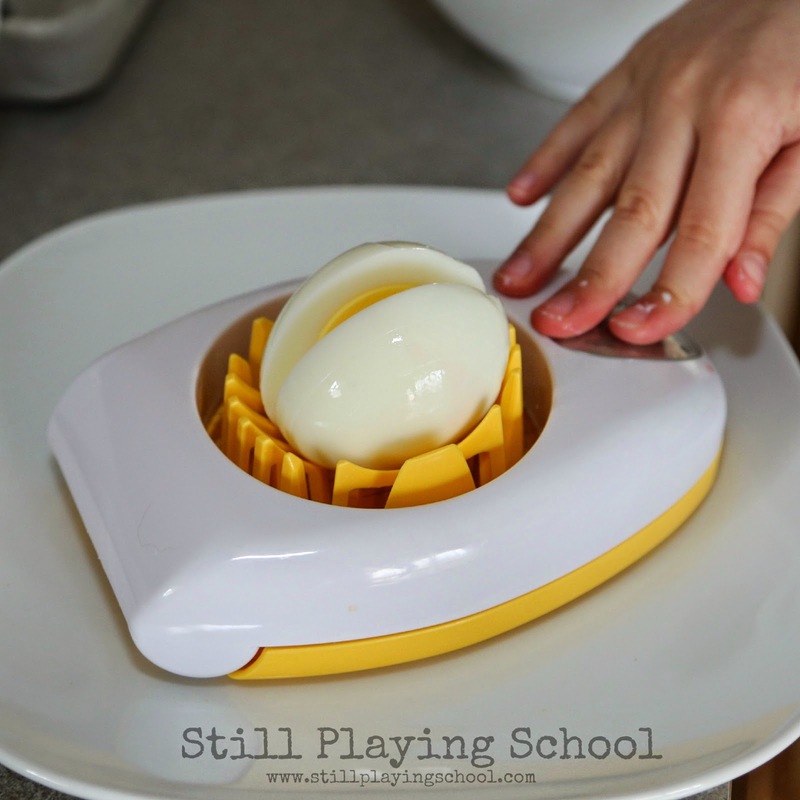 Our preschooler E loved using the egg slicer to quickly chop the eggs. We separated the whites from the yolks then sliced the egg whites again the opposite direction using the egg slicer's chopping option. 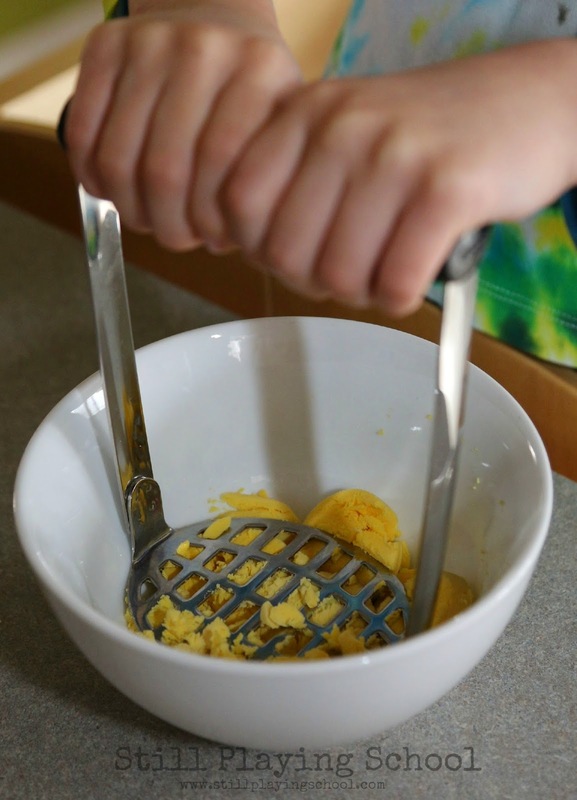 The yolks were pressed with our potato masher. 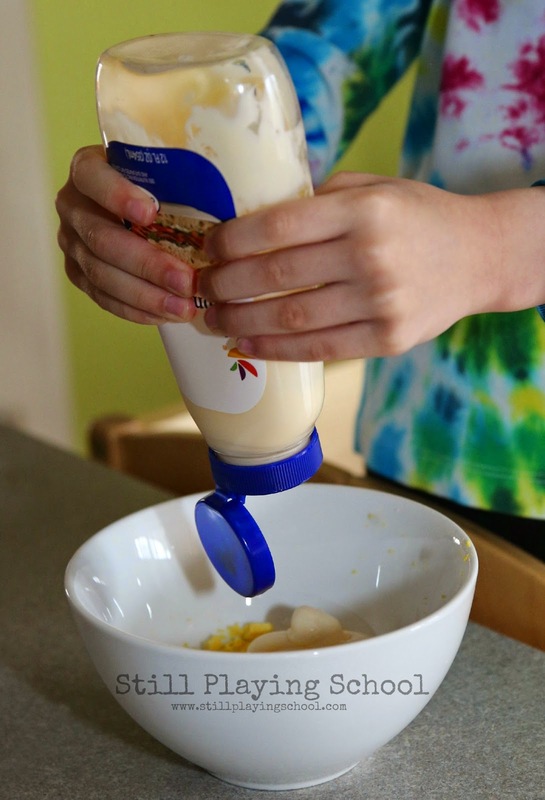 Next we added 1/4 to 1/2 cup mayo. I'm sorry but we eyeballed it. E loves to watch Rachael Ray and she uses the term "eyeball it!" We use the squeeze bottle for more fine motor work! E squeezed in about a tablespoon of mustard. She also loves using the salt grinder so she seasoned to taste. My taste. She won't eat egg salad, kid friendly or no, so honestly this was my lunch. Since I knew my darling girl wouldn't eat this I added about a tablespoon of onion. I like a crunch to my egg salad but if you don't want to use onion you could use celery instead or both! We combined the yolk mixture back in with the chopped egg whites and onion. 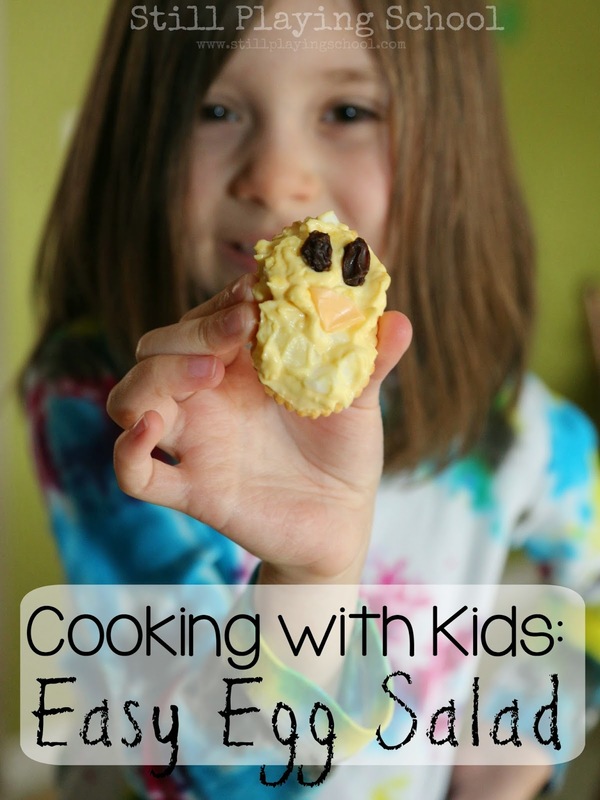 E was inspired to make chick egg salad crackers for her little brother (which you can see in our title image). She used raisins for the eyes (black olives would also work well) and a little triangle of cheese for the beak! I love egg mayo and you never know one day she might try it!